What a fantastic opportunity. Our musical team spent the day at Grovewood Primary, with children from 8 primary schools and the musical masters from Fitz. 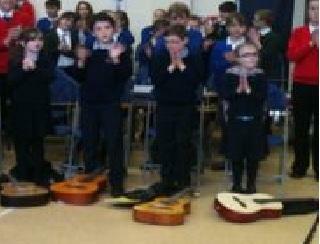 The Fitz pupils led the day, under the direction of a very important conductor from the Philharmonic! 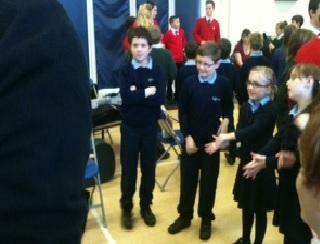 Everyone worked hard and their success was celebrated in an outstanding performance to families at the end of the day. All day I was practicing songs with everyone. 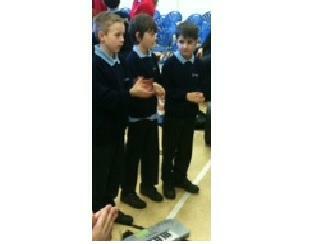 At the end there was a big performance and everybody said it was fantastic! S.
I really loved it. 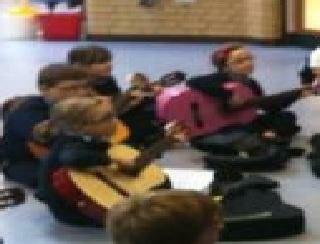 I played my guitar and I loved learning different tunes. It was outstanding. The Fitz people were really nice. Thank you. L.
It was fun playing piano in a group. T.
The concert was great because I like playing the piano and all that they showed me. A.
I loved the concert because I love playing the guitar and doing it in front of all the adults. 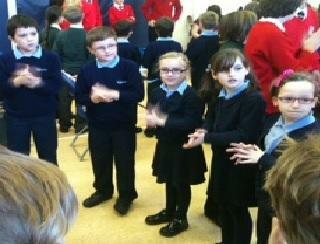 M.
We learnt the A minor cord, and we gave a really big performance! J.